Collisions With Balloon Cables and "Squeakers"
positions of balloon barrages and ordered to fly around them and avoid the general area. consternation of the balloon crews and officers. Within 5 days of war being declared and barrages being operational, a Swordfish aircraft was flying over Plymouth at 2,500 feet through a barrage that was at 5,000 feet. It hit a cable. Despite wing damage, the pilot managed to recover from the dive at around 2,000 feet. His wings were cut by the cable but not enough to give a total loss of lift. 1940 causing a Heinkel to crash into the sea) eleven friendly aircraft had hit cables with 5 of these being fatalities. 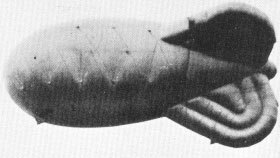 In June 1940 Captain D.H. de Burgh of the Royal Aircraft Establishment at Farnborough was tasked with a method of making aircraft aware that they were in the proximity of balloons. Suggestions varied from various coloured searchlight beams, ground mobile radio beacons, lights attached to the balloon cables, and other radio methods. operational bombers were using on their TR9 receivers in the aircraft. The TR9F set was under the seat in most bombers. an abrupt note as soon as the aircraft came within 8 miles of the transmission. 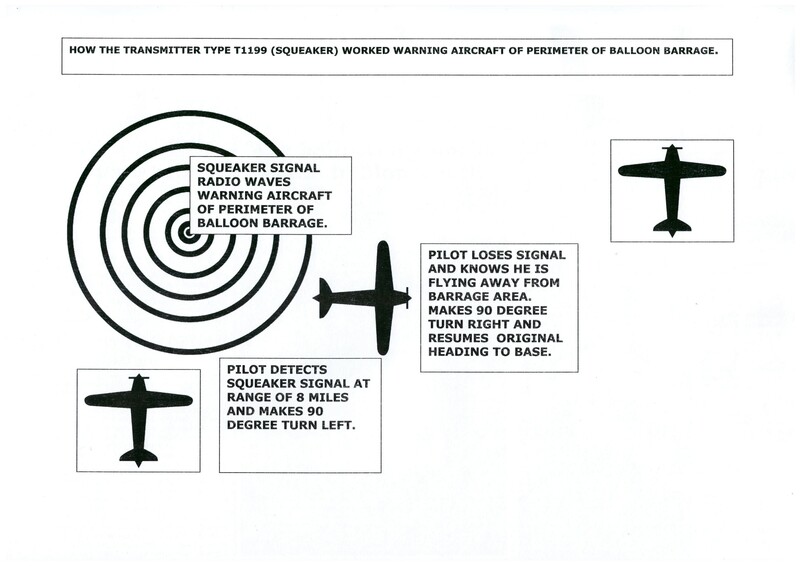 such a way that they gave a signal to warn aircraft when 8 miles for the balloon perimeter. just one central set but several to be placed on the barrage perimeter. Squeakers to give enough coverage. frequency. The last type was also a yellow band operating on 2.405 mc/s to 2.42 mc/s for Coastal Command. Electronic equipment in 1940 was not well protected and as the numbers were increased the failures of these Squeakers began to increase. bombers were returning from missions. This covered barrages from Harwich, Humber, Tyne, Tees and Blyth. The timings for close-hauling were decided between the various Commands involved. sites conditions might prevent the close-hauling to 1,000 feet. became what was known as Balloon Marker Lights. This option caused much consternation for various civil authorities and private individuals who thought that was simply advertising their position to the enemy. ones. The frequency of the flash was once every 25 seconds. flash for 5 seconds duration or 12 times a minute. They were switched on between dusk and dawn as well as in conditions of poor visibility. information. During their lifetime the Marker Lights were constantly re-sited for many reasons. both warning devices were in regular use. the risk that winter weather would cause higher toll. Marker Lights were required to continue to operate. This new policy was implemented with specific rules for each of the city, country and estuary barrages. luck rather than any judgement. The Crewe barrage recorded nine friendly aircraft flying through or over their barrage in one month! Cross-country flights not giving a wide enough berth to barrages. Pilots who were lost and unable to find a landmark such as a river or railway line. From January 1941 it was decided to switch Marker Lights off in areas that were under attack or where attacks were a clear threat. the civilians below. Despite this there seemed to be no change to the casualty rate. Air Ministry decided that pilot ignorance was now no longer an excuse for these infringements. In June 1941 Balloon Marker Lights were totally withdrawn, much to the relief of civilians living near to one and replaced by Squeakers. Paradoxically the replacement of Marker Lights by Squeakers was as unpopular with air crews as the Marker Lights had been with civilians! operational and had no serviceable issues at the time. Marker Lights. This did not please Balloon Command. pleasing some of the people some of the time but not all of the people all of the time! recovered showing the exact location of the British Marker Lights. This sounded the death knell for these lights. infringements by friendly aircraft but in September and October it was 50 and 63 respectively. Air Marshal Sir Leslie Gossage suggested that one option was to ground the barrage except when warning of an attack. This was at odds with the policy of keeping the balloons up at all times. It was decided not to aircrew aware of this policy as it was thought the crews might act recklessly if they knew. After much discussion between all three Commands, it was decided to ground all inland balloons but keep the coastal ones flying. The inland ones would be let up if an attack was imminent. attack was imminent provided they had sufficient telephone warning. The policy worked as although infringements actually increased, collisions fell. of the close-hauled situation and taking reckless advantage of it.